If this album sounds familiar it's because it was released last year on Powerage records, but now The Treatment have signed with a major label, Spinefarm it is now receiving a re-issue through Spinefarm which should bring it to the attention of a far wider audience. The album has been fully re-mastered and comes with two bonus tracks, so even fans who bought the original release will be tempted by this re-release. The band only formed in 2008 so are doing amazingly well for such a new young band - to have their debut album released then to be snapped up by a major label who then re-release the album is impressive. They certainly deserve it though they put on great live shows and the album is excellenr - more on that below. The Treatment have a sound influenced by classic rock bands and sleazy bands such as Motley Crue. Bands such as Black Stone Cherry and The Answer are taking a nostalgic classic rock sound and giving it a modern re-working, and The Treatment fit in to that same category - it's got a classic rock sound but without feeling dated. Some brief comments on a few of the songs..
"The Doctor" has a real ACDC feel to it and is a great pounding rock track. "Nothing to lose but out minds" is strongly reminiscent of the Mott the Hoople classic - "All the young dudes" - in addition to a couple of guitar pieces, the chorus really does seem as though you could just change the lyrics to those of "All the young dudes" and it would still sound right. Reminding the listeners of such a classic track certainly isn't going to hurt. "Lady of the night" is one of my favourite tracks on the album with its great chorus and strong guitar driven sound. It's nice to see that the CD booklet includes full lyrics for every song. This album is superb - and very addictive. Since getting it I've been playing it pretty much non-stop for the last few days, and whereas with many albums I'd be getting tired of it after a few listens, with "This might hurt" there's no sign of that happening. A great album from these young British rockers - lets hope we don't have too long to wait till their second album. 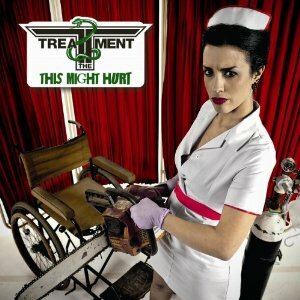 The Treatment are on tour in December - get to one of their shows for a night of great music.